I have recently given up caffeine myself in fact as I have had problems with palpitations for a while. I don't drink coffee - it would have me jumping up and down all afternoon! - but I did drink green tea and that contains some caffeine too. We stock over 100 different types of tea in our store and we find that the Yogi and Pukka ranges are particularly popular. The spicy teas, which contain ingredients like ginger, cardamom, cinnamon, cloves and black pepper are wonderfully warming during the autumn and winter months, which are now approaching. Chai is an Indian tea which is traditionally made with milk and features warming spices like cinnamon, cardamom and ginger. Herbal teas such as chamomile, valerian, peppermint, elderflower and nettle are also very popular. The first two are known to help with aiding sleep as they have a calming effect. Holy Basil is an Ayurvedic tea which a number of our customers like. All these teas are available in bag form or loose leaf. The teabags are more convenient whereas the loose leaf teas are more flavourful, so it just comes down to personal taste. Rooibos tea is another great alternative to caffeine. It can be prepared in the same way as black tea, with added milk and sugar to taste, or it can be served with a slice of lemon and a spoon of honey as a sweetener. For those who prefer fruity flavours, there is a whole variety of fruit teas, ranging from apple and cinnamon to lemon, blackcurrant, rosehip and hibiscus. These are full of flavour and those with added spice will help to warm you up this autumn. For those who enjoy their coffee but want to cut out caffeine, there are plenty of alternatives from brands such as A.Vogel and Barleycup. These contain ingredients like malted barley, chicory and acorns and - according to my husband - taste very similar to normal coffee! Dried dandelion root is another option. 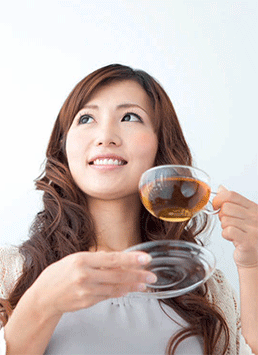 Green tea does contain caffeine, but it is also rich in antioxidants, making it a good choice of hot beverage. Caffeine-free varieties are available, but with the big mainstream brands chemical solvents are often used to extract the caffeine, meaning that it is not as healthy as you might think. Lastly, if you like the idea of making your own tea, why not try growing a pot of mint in your back garden, and then using the leaves to make a mint tea? You just need to pour some boiling water over the leaves, allow them to steep for a while and then enjoy! Stirling Health Food Store is based at 29 Dunbarton Road, Stirling, FK8 2LQ and is an award-winning independent health food store which has been established since 1976. Josine took over the ownership of the store four years ago and it has a loyal customer base within the local community. The store stocks a large range of wholefoods, organic, vegetarian, vegan and gluten-free foods, as well as vitamins, minerals and supplements. Chemical-free beauty products and cleaning products are also available. The store also has a homebrew section comprising equipment and accessories for brewing wine and beer.